My first finished dovetail box. 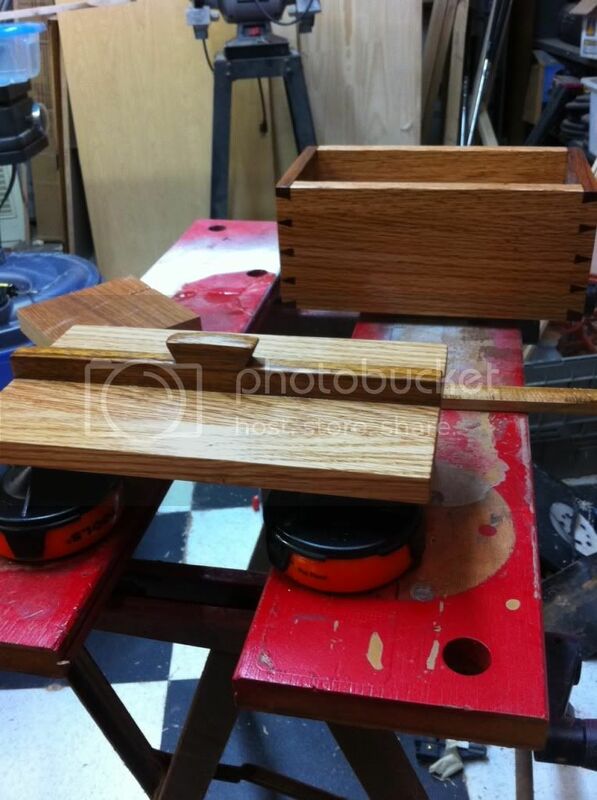 I started on this box with not much of a plan for the lid or box bottom, so I struggled with what to do. I had a small piece of brazillian cherry and oak left and instead of having to glue up panels of brazilian cherry to make a lid, this is what I came up with. This originally started out to be a sliding pencil box and I started the project making complete dovetails all the way to top leaving no room for the sliding top, soooo, needless to say, it became a keepsake box instead. haha. The finish is 1/3 BLO, 1/3 Paint Thinner, 1/3 spar varnish. Not a bad finish just takes FOREVER to dry, but looks nice and applies easily. pretty darn amazing box Greg super job. Having just done my first hand-cut dovetails, I have a tremendous amount of respect for anyone who does them on a regular basis. This was the first set of dovetails that I just marked the depth of the cut and then completely free handed the angles and positions of the tails. I started handcutting dovetails and I’ve done a few non-completed dovetail boxes just for practice, but I always laid out everything using a dovetail marking gauge, and after watching a few more videos I realized that as long as the angles were close, to the right angle, it would be fine. I used to take 20 mins alone laying out everything precisely and then I realized, “This is a huge waste of time, let’s just mark the depth and go at it.” and Voila, not perfect, but not bad. Those dove tails in that box look great. With more hand cut ones being shown, I’ll have to give it a try! Nice dovetails, congrats. Looks like the practice paid off. Nice lookin’ dovetails sir. What kind of dovetail saw do you use? I’ve never marked the angles before cutting either, I use dividers to lay them out but after that it’s all freehand. With this one, I used the veritas dovetail saw which is a wonderful piece for the money. As I’ve gotten a fair amount of practice, I’ve been wanting a Lie Nielsen thin-plate Dovetail saw and I just got one of those and I must say, as good as the veritas is, I personally think the LN is absolutely amazing. I think if you cut dovetails a lot, that’s the saw to get. To learn to cut dovetails, the veritas is the saw to get. Just my 2 cents. Of course, they’ll be the naysayers out there that will tell you that use a $10 hacksaw, and good for them, but generally if I’m going to handcut dovetails, I do it because I enjoy the process and having a comfortable saw that cuts fast, straight, and true certainly makes that process a much more enjoyable process. I also have that new fretsaw that’s on the market that highland woodworking sells. Makes cleaning out the waste cut with a thin kerf saw a breeze compared to a coping saw. Also, I tried a japanese saw because everyone said that’s the way to go and I’m just gonna say that I’m a push guy, not a pull guy. I’m more accurate cutting with a western style saw. I’m not an expert, but if I’m telling people where to start, I say try out a couple saws first and whatever feels best, go with that. It’s like putters in golf, if there was one putter that made everyone a better golfer, everyone would be using it, but almost every golfer has a different putter because it’s what FEELS good to them. I think the LN feels great to me. I love to look at handcut dovetails and yours look really great. I’m still trying to get mine right. They are not good enough to bring out the shop to show anybody but I am not giving up.